Only had to work 10 hours today, so took an hour to mess around in the garage. Have to make the time. Was able to rough-test fit the inner rocker panel today (Photo 1). Seems like a reasonable fit so far, but still needs some minor adjustments. The door pillar bottoms will need some more attention, they are a little bent up now from the work I had to to remove the original rockers (maybe the bottom 1/2", so not too bad). Overall, pretty pleased. I figure if I can do the inner and outer rockers myself I'll save a good $5k-$6k with the insane rates they charge nowadays. Just hoping I get it right. Will use the other side to measure everything and make sure it's as close as possible before I commit to welding anything. I'll have to tack on the outer rocker and throw the doors back on, I suspect the repro outer rocker may need some adjustment for proper fit. I fired the engraver yesterday. No apology or anything, he just gave me my heater tag and I left. I'm sorry I was a burden to him by trying to give him money to do him to do 15 minutes worth of work. I found another guy up the street, so we'll see how he does. He says 7 business days. I got my Eastwood spot weld adapter on Friday and was able to use it today. I was very pleased with it. It said in the instructions that for my particular welder, I do not need to drill holes in one of the panels, which will save me hours of time. I used the adapter kit to spot weld the two overlapping sections on the vertical rocker support panel and it worked quite well. It took me a few tries to get the settings right, but by the second section, I was getting fairly consistent welds and full penetration. Nothing nearly as nice as the factory, but again, no one will see these particular welds (Photo 1). With a few minor adjustments, I should get some nice welds for the actual rocker panel, although right now, the welds are too wide. Speaking of the rocker, I was able to remove the factory primer on the inner tabs and spray them with weld-thru primer, in preparation for welding them on. Hopefully next weekend I can get the repro inner rocker fitted, if not actually welded on. As a side project, I started on the goal-post upper panel. This is where the tops of the floor boards and the trans tunnel attach, then the panel itself bolts onto the main goal post (Photo 2). I also started on the defroster tubes and vents that come out of the heater. Here's the newly-painted versions of the vents and panel (Photo 3). I'm zinc-plating the hardware and will be applying new damper felt. My engraver keeps saying "I have other work, but give me 24 hours" for my Smiths heater tag. He's given me this line 3 times now, still hasn't done the engraving after over a month. I'll be picking it up tomorrow and taking my business elsewhere. No word on my engine, either. I should hear something any time now, but I don't expect to hear anything unless I contact them.  I get a feeling from many shops that I deal with in general that customers are a burden and a low priority. They have so many customers that it doesn't matter to them if they take their business elsewhere, there will always be another customer. It's always up to me to contact these businesses to try to figure out when they will have things finished, they never contact me and they never come close to meeting their deadlines. This is becoming quite a long restoration with many delays. Glad to see the progress on everyone else's cars. Does anyone know of a source for a new Steering Column to Dash Clamp Gasket? Mine has worn out completely. Steele Rubber has some items that seems close, but I'm not sure if it would work. Thought I'd ask to see if anyone else has found a source. Thanks! Quick update, yesterday I finished welding all the patch panels to the bottom of the inner rocker vertical support (Photo 1). The welding was very challenging for an amateur like myself. The middle section had much more surface rust on the upper portion than did the front section. I had a lot of burn thru where the metal was thinner on the upper half, so it was a battle to keep the heat low enough not to destroy all the metal, while keeping it hot enough to make a connection between panels. Lots and lots of grinding, plugging pin holes, repeat. The front section was relatively easy and I got better welds and minimal pin holes. A sloppy job, indeed, but no one will see it. I'll be cleaning up the inner side of the work more, as that needs to fit fairly flush against the frame rails of he chassis. Today, I should be starting on grinding out what's left of the spot weld fragments on the panel, repairing a couple holes I made in the panel whilst chiseling, repairing a rust-out hole on one of the door pillar bases, and maybe getting time to wire wheel and metal treat the middle and weld-thru prime the portions where the inner rocker will be spot welded. You're right, I got it backwards. Ok, with the info I have now, it seems I'll have to get it converted back to a 3-brush arrangement. I don't think my generator guy understands the early stuff. Thank you for all the posts, they have been very helpful. So much I don't know or understand about electric. Thought more about your post and "subtle differences" and I noticed that my Chevy generator has a 4" pulley, whereas my Plymouth one that's on the car now has a 3 1/2" pulley. I'm no electrical guy, but I would assume with a bigger pulley, it would turn more RPMs and generate more current. If this is true, that may fix most of my problem and get me into positive amps, but if so, does a "fixed" brush system work okay versus the "adjustable" brush system on a car like this with a cutout switch? Simply put, if I swap the pulleys and it gives me positive amperage, should that be fine? Thanks! I have a disease that makes me want to put everything on my 1930 Plymouth back to original. So, I took the working 943J Delco Remy (early 30's Chevy) and replaced it with a 943R, which is the correct model for my Plymouth. The "new" 943 R was a junker I found on this site and had to be restored. I took it to my local generator guy. He built it as a fixed-brush system as that's what he said it had when I brought it in. He did a great job restoring it, but when I re-installed it, it didn't work, the amp gauge read a constant -2 Amps. I called him about it and we discovered that he rebuilt it at negative ground. He didn't know it was positive ground and I forgot to remind him. He converted it to positive ground. I put it back on the car and same thing, -2 Amps at all engine speeds. The Chevy one was working fine about 4 weeks ago when I took it out of the car. I did a test a friend told me about from the Cadillac club magazine to disconnect the battery at the positive terminal (positive ground) and if the car stops running, that means the generator is not producing anything and that the car is running purely from the battery. I did the test and the car stopped running immediately. According to the original owner's manual, this should have been an adjustable system with an adjustable third brush. The Chevy one I had on there before had this system and I had it dialed in very nicely. I believe my 943R would have been an adjustable 3-brush system originally and that someone must have converted it. The screw for the adjustable portion of it is still there, but the rest of the mechanism is gone. So, my question to the group is, can a non-adjustable system even work on a 1930 Plymouth with a cutout switch, 6-Volt system? Any ideas on why the system wouldn't be working? If not, I was thinking of shipping it to an early generator specialist to have converted back to a 3-brush adjustable system. Please do not respond with "Just put the old one back on, why would you change it, moron?" Don't forget, I have a disorder, I want the 943R original one on there, in the spirit of the AACA. Other thoughts? You are right, but I'm not that good. I'm going to try the adapter, it's not that pricey. It sets up the right distance and makes everything vertical and uniform, so I'll try it out. Those pins are a good idea, I may pick some of those up soon. Right now, I have really easy surfaces to work with, so clamps and magnets work fairly well for now. Thanks again for the tips, they are all very helpful and will improve my work and speed up the process. Left work early (or late, considering I had extra hours for the week) and did some more fREAL work on the MGA. It's getting easier as I go since I'm learning along the way. Today I bought some better grinding wheels and spent time grinding most of the welding on the rocker support mostly flat. Opened up a lot of holes in some sections where my welding was not the best, but overall, not too bad, most of it turned out satisfactory. Started on the front section by cutting out the bad portion (Photo 1). The front was better protected, so didn't have to cut quite as high. Good at that, as there is a support bracket welded toward the front on the other side, so I didn't have to mess with that. The only sheet steel I can find is 24" long, and of course, I need about 26", so had to leave a gap which I'll fill later (Photo 2). So far, treated the overlapping metal at the left end with weld-thru primer, as it overlaps the center piece, and cleaned up the rust where I'll be welding. Right now, just held in there by a large magnet to get it set up. Will probably weld it tomorrow. After that, I'll weld in the gap, then grind it, then double back and weld up the holes that are left over from the bad welding from before, then grind it again. I'll throw a good dose of weld-thru primer over the whole thing, then do a little hammer and dolly on the bottoms of the door pillars, as I had to fight with them to get out the rusted inner rocker. After that, I'll prep the repro inner rocker. Not sure how I'm going to spot weld it yet. My friend never got back to me about how his home spot welder plugs in, so I'll probably just use the Eastwood spot weld adapter, which will unfortunately involve me drilling dozens of holes in the inner rocker in which to put the "spot welds." Pleased with my progress since I've never done this before. That's a great site you put together. I'll have to jump back in more in depth, but quite helpful, thanks. Nice garden, too! Thank you, the other link worked, so I was able to get the ticket. Another problem solved, thanks! Thank you for the reply. 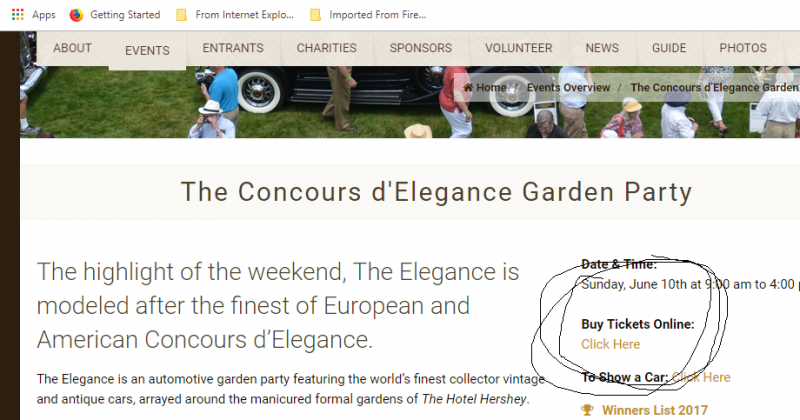 However, if I go to the website for the Concours (just the "car show" part), click the "buy tickets" link that I've circled in the photo, it will take me to a page by "Extreme Tickets," which says that there are no events available. Either the online ticket capability is broken, or I'm going about this the wrong way. Would you be kind enough to show me where to purchase tickets online, if the below location(s) are incorrect, please? If the below method is correct, then there is an issue that should be rectified. I tried to get tickets to the Elegance Concours Garden Party today, but the link says "No events available." 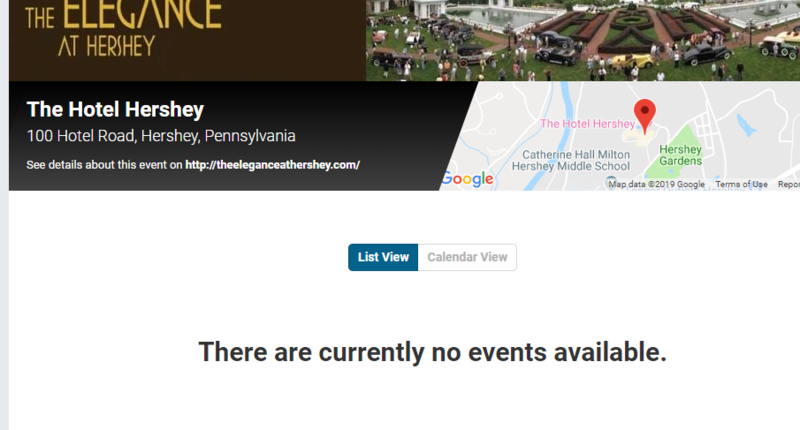 Is the event sold out? Thanks, I will definitely take a look! Well, yet another setback. I called the British car shop today about my engine. It has been there for over six months. I was greeted with "good, you got my message!" I never got a message. Supposedly I was called on Friday. Good timing, but never got the message. Anyway, long story short, my engine was farmed out to a machine shop (which is fine) for line-boring, cylinder boring, honing, magnaflux, or any other service the block needed. The block was finished about 2 weeks ago, returned to the British car shop, who then discovered a crack at the rear of the block near the oil journal, or something like that. The shop was very upset with the machine shop, as they should have caught this. To repair the crack requires another specialist and will be about a 6-8 month wait, plus only a 50% chance of success and an 80% chance the crack will come back in the future. The British car shop located another block that may fit the bill. Luckily, my engine tag can be moved to another engine, as nothing is stamped in the block, so I'm not too upset. Anyway, they need to now check out the "new" engine to see what it needs. I'm supposedly at the top of the list, due to it being their error that they didn't catch it earlier, so the British shop is estimating 1 month more, if everything checks out okay, which means 3 months to me. I do think the British car shop is doing fairly well for me, although they are not keeping up with communication. I don't know the exact issue with my old block and if the crack was simply missed during the magnaflux process, or it developed over the last 6 months, so I can't really get upset, just frustrated and disappointed. I really wanted to get the engine in the car before spring, now it's looking like mid-summer at best. At least I got in some more grinding on the welding after work. I'm going to have to find a coarser grinding disk, it is taking forever.